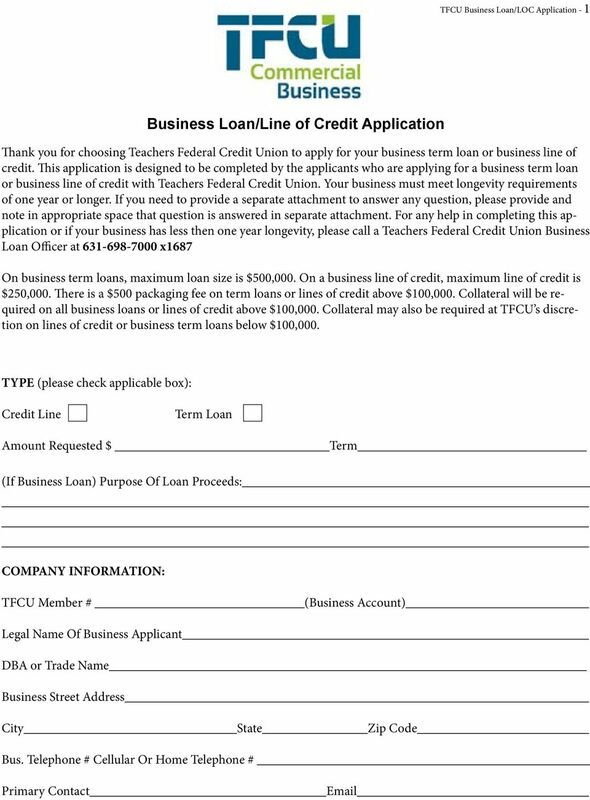 Download "Business Loan/Line of Credit Application"
4 TFCU Business Loan/LOC Application - 4 List all collateral with current asset values to be used as security for this loan/line of credit - (Please use separate attachment if necessary): The following are the documents that are required for the evaluation of your TFCU business loan, or line of credit request. Please supply all attached documents as listed and also provide the relevant information pertaining to your proposed use of proceeds. I.E. Commercial Real Estate Purchase, Business Acquisition, Financing Equipment, Working Capital. Etc. Documents to be provided: 1. Business tax returns of applicant business for the last two fiscal years(signed and dated) 2. Personal Income Tax returns for previous 2 years(signed and dated) - Each 20% + owner 3. Interim balance sheet and profit and loss statements completed within 90 days of application for loans above $25,000 (Signed and dated). May also be required at loan officers discretion. 4. Copy of Lease for Business Location 5. 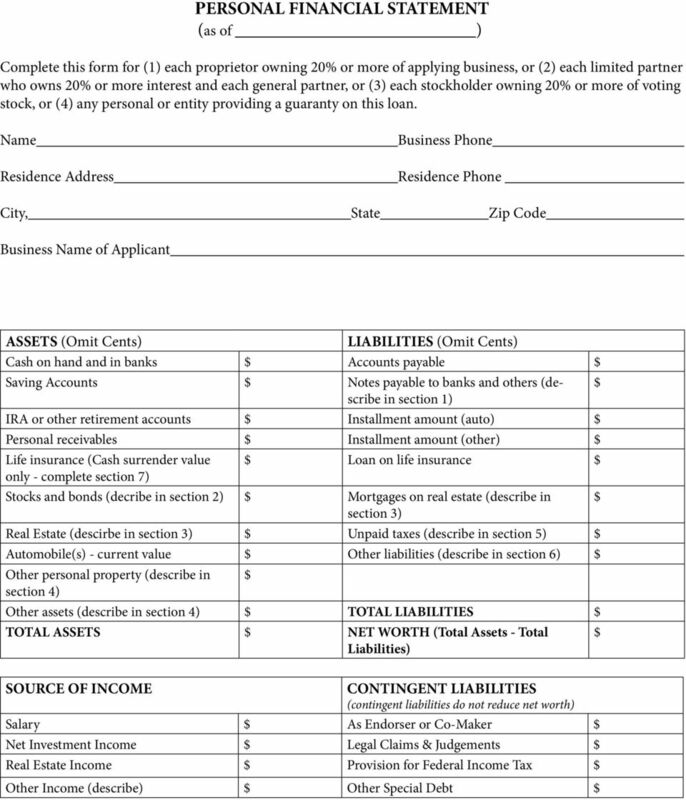 List of names for any affiliates which the applicant has at least a 20% ownership interest Description, including ownership structure, of business Business tax returns for the last two years 6. If not a U.S. Citizen, please attach Proof or Resident Alien Status. Photocopy both sides of the Alien registration card. 7. Articles of Incorporation, Articles or Organization, Certificate of doing business if DBA. 8. If the loan will be used to finance the purchase of machinery or equipment, you should include: Description of machinery or equipment with model and serial numbers Copy of the buy/sell agreement or purchase order 9. 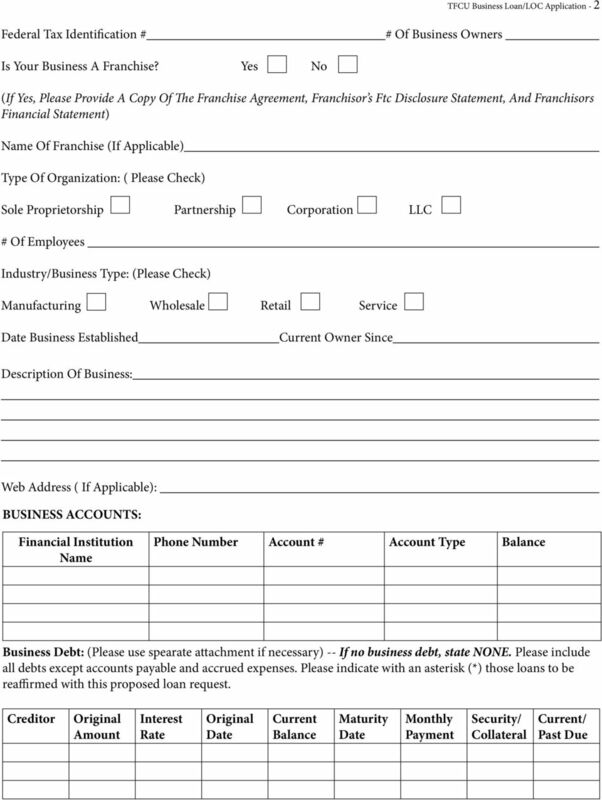 If you are purchasing an existing business with the loan proceeds, include: Current balance sheet and profit and loss statement of the business to be purchased Year-end financial statements for the last three years Business history Federal Income Tax return of business for previous 2 years Proposed Bill of Sale including the terms of the sale Schedule of inventory, machinery and equipment, and furniture and fixtures Business plan including supporting assumptions for financial projection Teachers Federal Credit Union Business Loan Officers may ask for additional information at their discretion. 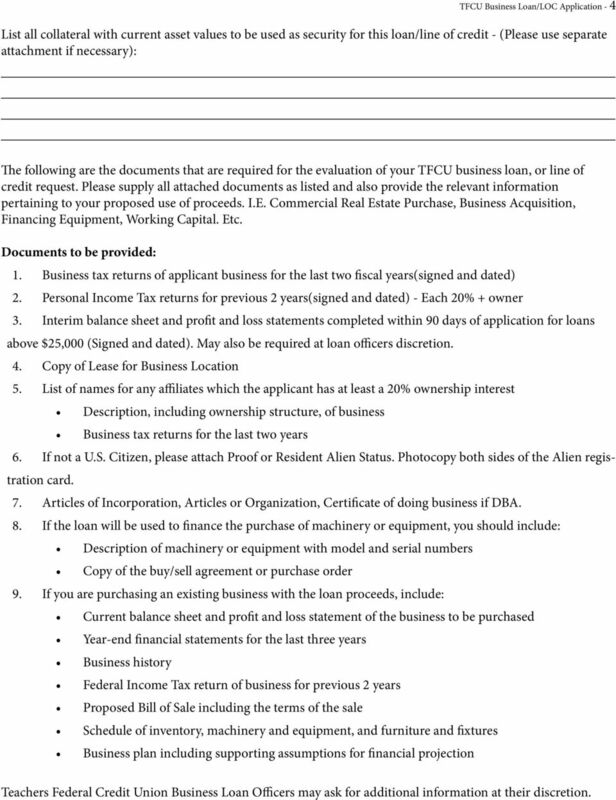 7 TFCU Business Loan/LOC Application - 7 SECTION 1. Personal Notes Payable to Bank and Others (Use attachments if necessary. Each attachment must be identified as a part of this statement and signed.) 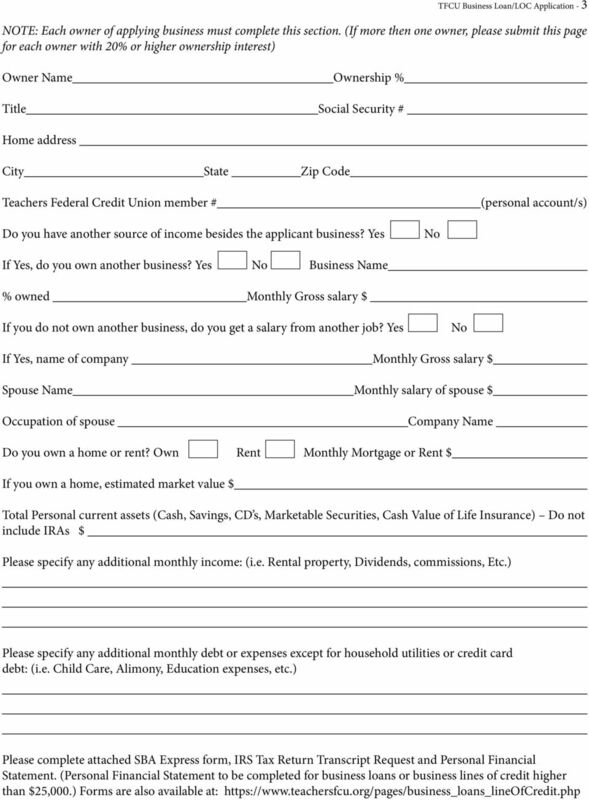 Name and Address of Noteholder(s) Original Balance Current Balance Payment Amount Frequency (monthly, etc.) 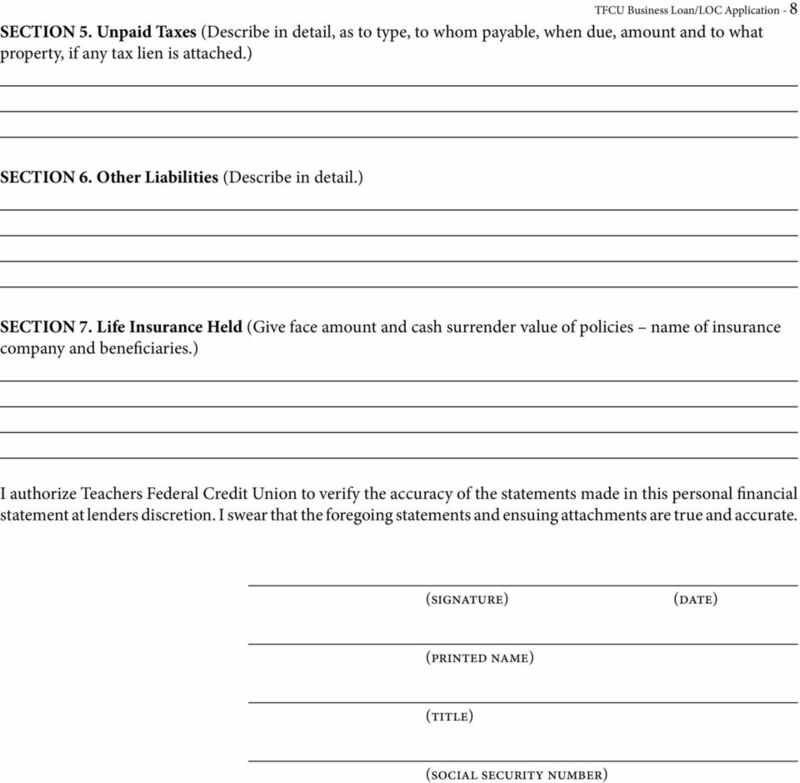 How Secured or Endorsed Type of Collateral SECTION 2. Stocks and Bonds (Use attachments if necessary. Each attachment must be identified as a part of this statement and signed.) Do not include your ownership interest in an applicant or participating DBE firm. Mark value as of date of this statement. Number of Shares Name of Securities Fair Market Value SECTION 3. Real Estate Owned (List each parcel separately. Use attachments if necessary. Each attachment must be identified as a part of this statement and signed.) 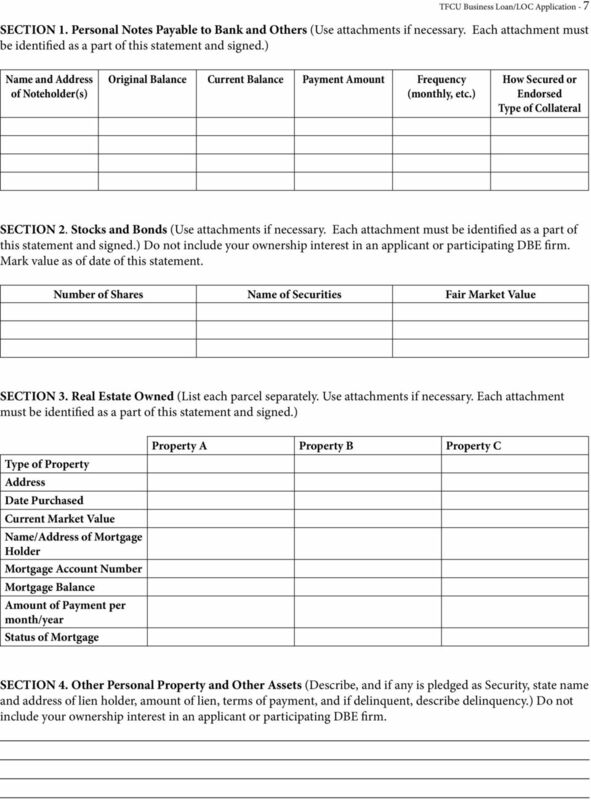 Type of Property Address Date Purchased Current Market Value Name/Address of Mortgage Holder Mortgage Account Number Mortgage Balance Amount of Payment per month/year Status of Mortgage Property A Property B Property C SECTION 4. Other Personal Property and Other Assets (Describe, and if any is pledged as Security, state name and address of lien holder, amount of lien, terms of payment, and if delinquent, describe delinquency.) Do not include your ownership interest in an applicant or participating DBE firm.